In this cozy den, my client knew she didn't want to change much, but she knew something was missing. The furniture was working well, the paint color was just as she liked it, and she did not want anything different or fussy on the windows. So, what could still be needed to make the room feel finished? Like the glue that holds something together, or the icing on top of a birthday cake, things just don't stick together or taste as sweet when that certain something is missing. 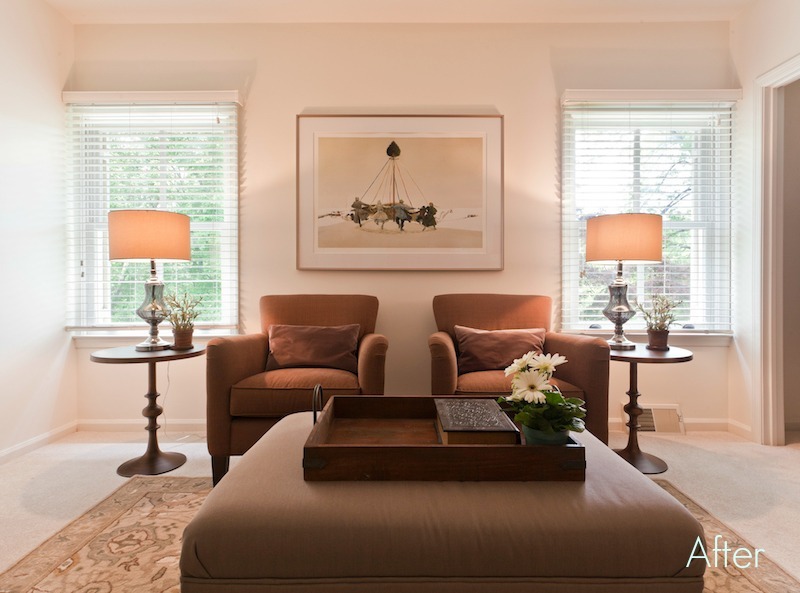 In our homes that is what I like to call the "top layer"--the finishing touches such as the right lighting, art, and other decorative elements--the stuff that pulls things together and makes a room come alive. So what exactly is different? What elements did we add to pull everything together? We started by bringing in a new rug-- I wanted something that would add a softness to the sepia-toned palette--and we added a larger ottoman for extra comfort and more table space. You may also notice that there are new tables with matching lamps flanking the chairs, giving more presence to the symmetry that was already there. And to think many would believe the room is finished once the furniture is in place! There is a whole other layer to be added to bring cohesion and beauty into our homes--so be sure to follow through on those final steps and add those little details that make all the difference. As always, a HUGE thank you to Laura Kicey for her amazing photographs of my work!